This richly brocaded ensemble illustrates the style of dress worn by women at court in England. Known as a mantua, the gown consists of a bodice with a train at the back. A very wide petticoat of matching silk completes the ensemble along with a triangle of silk known as a stomacher, in the centre front. Although considered stylish daywear in the early 18th century, the mantua had become very old-fashioned by the 1750s and was worn only for court dress. Wide hoops were beginning to go out of style, but kept their extreme width at court. To make up for its conservative cut, court dress was always made from the most fashionable as well as expensive fabrics and trimmings. This example is made from an ivory silk brocaded in a pattern of stylised flowers and leaves. The abstract form of the motifs is accentuated by the non-naturalistic colours of the precious metal threads. Such a design is typical of French silk weavers and the fabric was probably imported. However it could also have been woven in London, as English weavers copied French designs very closely. 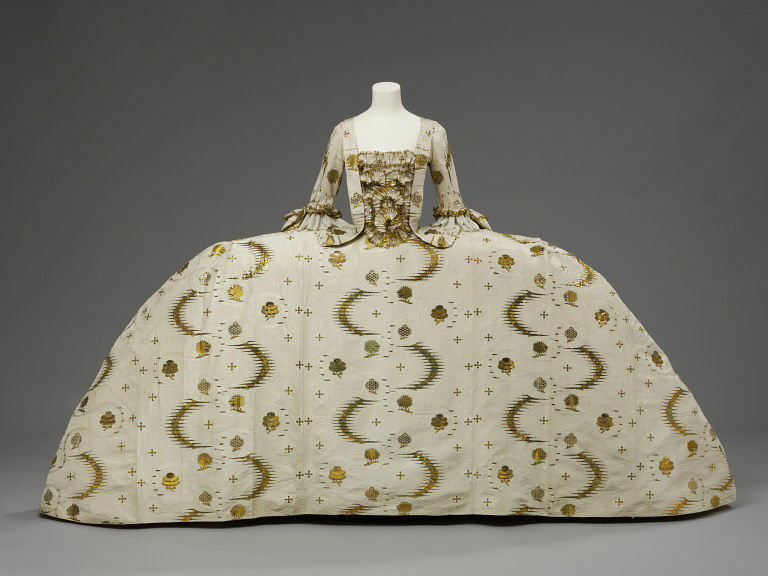 An English court mantua and petticoat of French silk, brocaded with silver-gilt threads, with stomacher of different fabric. Silk : cream gros de tours with self-coloured supplementary weft. Brocaded in gilt thread, in file, frise, strip and combined frise and strip. Plain selvedge. Pattern repeat 33.5 cm. The mantua and petticoat came into the Museum unpicked from their original construction. They were reconstructed in the V&A's Textile Conservation Studio. 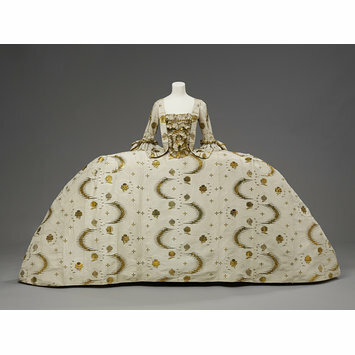 The mantua belongs to the mid-18th-century ceremonial version of the gown. It arrived in the Museum in 1993 in fifteen pieces, at which stage the independent dress historian Cally Blackman made a paper pattern of it. Fourteen years were to pass before its conservation and reconstruction became possible, thanks to the development of an important loan exhibition to the Kremlin Museums in Moscow, entitled ‘Two Centuries of British Fashion from the Collection of the Victoria and Albert Museum’. At this exhibition in Autumn 2008, the mantua greeted visitors in all its splendour, displayed along with other simpler gowns and silks in a theatrical setting that evoked the English countryside. The process of achieving this splendid position and presence for the mantua had been complex. The gown had been found in May 1989 by Theresa Merville Crawley while clearing her grandfather’s attic in Cambridge in a box labeled ‘dressing up clothes’. A paper label indicated that it had once belonged to a member of the family called Mrs Colonel Clapham, who came from a prominent Welsh family. She was granddaughter of Sidney Parry (née Lewis, b. 1738), an heiress with a considerable fortune who inherited Madryn Castle on the Llyn peninsula. It seems possible that Sidney Parry was, in fact, the original wearer of the mantua, as she was of sufficient status to attend court, of sufficient wealth to own such a splendid gown, and was between 17 and 22 when the gown was made between 1755 and 1760 – in other words at an age where she might be presented at Court. In between the 18th-century use of the garment and its arrival in the V&A, the bodice had been used for 19th-century fancy dress. The adjustments to make it fit a 19th-century body included shortening the sleeves and removing the train. The petticoat had been taken apart entirely and reassembled, using only four of the original nine panels of silk that made up the skirt. The bodice was in seven parts, as was the petticoat. The silk was crumpled and there was evidence of considerable abrasion to the metal threads throughout the entire garment. The conservation and reconstruction of the mantua in 2007 involved the input of many specialists. Previous curatorial records were examined and comparisons were made with two other mantuas in the Museum in order to check construction details against the pattern made by Cally Blackman in 1993. One other V&A mantua (T.44-1910) was so similar in construction that it could have been made by the same dressmaker. The paper pattern was then used to make a full toile of the mantua, petticoat and stomacher in unbleached cotton muslin. This allowed the positioning of the train, sleeve ruffles and petticoat panels to be tried out on a mannequin without handling of the mantua itself. This procedure underlined the extremely small size of the bodice, and the extremely wide skirt, and thus the need to create a custom mannequin in order to display it safely. The toile also allowed the mannequin acquired to be adjusted and padded to fit the gown perfectly. Before the garment was reconstructed and mounted on the mannequin, the silk required conservation treatment because of previous use in at least two different centuries and a considerable time in storage. All loose gold threads were sewn down with laid couching, and the silk was humidified to remove the creases. Wherever possible the original construction holes were used to sew the panels back together. This method of working was subsequently assessed as extremely satisfactory because it had enabled a minimal amount of handling of this rare textile object, and thus protected it as far as possible against any further damage. Support for the gown was essential. Again the paper pattern was an invaluable tool. Many layers of underpinnings were made: a stiff underskirt of cotton calico and steel boning, followed by a lighter petticoat of calico and net were covered with a silk petticoat. The bodice area was covered with cotton knit. Arms were made from silk habutae and cotton calico that were sewn to the cotton knit covering the body of the mannequin. False shift-cuffs were made from cotton lawn and then trimmed with 18th-century lace for display. They were sewn directly on to the arms of the mannequin. Mantua and petticoat of French silk, brocaded with silver-gilt threads, made in England, 1755-60 of French silk, 1753-55. The wide-hooped skirts of the mantua were already old fashioned in the 1750s, but women were required to wear this cumbersome style to royal assemblies and balls. It required skill to negotiate doorways and carriages while maintaining a graceful posture. Court dress was made from the most fashionable and expensive fabrics and trimmings. The silks were displayed to perfection on the mantua petticoat and train. Often woven and embroidered with gold thread, they sparkled in candlelight, with diamonds and expensive lace adding to the effect.